The Earl Grey tea in this custard is very subtle, but it marries nicely with the fragrant Meyer lemon. Initially, I had hoped that the lemon slices placed in the bottom of the ramekins would stay in place for a stunning presentation, but even embedded in the dessert, they make a lovely contrast to the creamy, mild custard. This recipe is adapted from the 2006 edition of the Joy of Cooking. Steep the tea: In a small saucepan, bring the milk and tea to just below a simmer. Remove from the heat, cover, and let steep until the milk cools to room temperature, about 1 hour. Prep the custard equipment: Preheat the oven to 325 degrees. Line the bottom of a roasting pan with a kitchen towel. Lightly butter six 6-ounce ramekins and dust the bottoms with 1 teaspoon sugar per ramekin (I used vanilla sugar because I had some, but regular granulated sugar is fine). Place one Meyer lemon round on the bottom of each ramekin, and place the ramekins in the roasting pan. Make the custards: Combine the remaining ⅔ cup sugar, the butter, and salt in a medium bowl and knead in the butter until the mixture is homogenous and no large chunks of butter remain. Add the egg yolks, flour, lemon zest, and juice, and whisk until smooth. Strain the milk, pressing the tea leaves to extract all the milk, and add to the yolk mixture. In the bowl of a stand mixer fitted with the whisk attachment, beat the egg whites until stiff but not dry. Whisk the whites into the egg-yolk mixture until no clumps of whites remain. Ladle the mixture (do not pour) into the ramekins; it may reach the tops. Bake the custards: Place the roasting pan in the oven and pour enough scalding hot water into the pan to come two-thirds of the way up the sides of the ramekins. Bake until the custards are puffed and golden brown and spring back when pressed lightly with a finger, about 25 to 30 minutes. Allow the custards to cool for 10 minutes in the water bath. 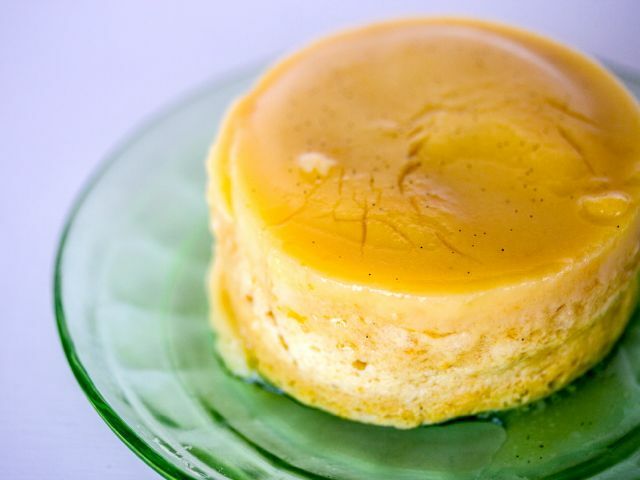 Serve the custards: Serve warm, at room temperature, or chilled, in the molds or turned out. To turn out the custards, run a thin knife around the insides of the ramekins. Place a serving plate upside down over each ramekin and swiftly flip the whole affair. Remove the ramekin to reveal the custard. Serve with whipped cream and/or fresh raspberries.